New research from Church Army suggests mission with young adults isn't as difficult as often portrayed. Church Army has released the findings of a research project on mission with young adults in England to discover what’s working – and what isn’t – in the Church when reaching out to 18- to 30-year-olds. “The findings are really encouraging in that they suggest that mission with young adults whilst challenging is not as difficult as one might think,” says Church Army’s Director of Research, Dr Tim Ling. The research was commissioned by the Church of England’s Strategy and Development Unit on behalf of the Archbishops’ Council to counteract the dwindling number of church attendance among the younger age group. Church of England attendance data suggests that just 0.5% of 18- to 24-year-olds currently attend an Anglican church. The nine-month long research project was centred on 12 case studies of different approaches to mission and evangelism among young adults. The people involved were from a variety of geographical contexts, social backgrounds and church traditions. At least 60 people had become Christians through the churches studied, with a further 48 reporting the case study church had helped them rediscover a lost faith. One common theme was the importance of creating spaces where young adults can belong and feel part of a community before they believe. The research also highlighted the need to be deliberate about creating further spaces for exploring faith together. “The research shows what is possible with young adults and captures some great stories of what pioneers are doing across the country. I really hope it will give local churches the inspiration and confidence to ‘have a go’ and apply some of these ideas within their own context,” says the Church of England’s Director of Evangelism and Discipleship, Dave Male. “Young adults can come to faith in today’s society, that’s the resounding good news in this research,” says the Church of England’s National Mission and Evangelism Adviser, Rachel Jordan-Wolf. Main photo: The Hub in Hitchin, Hertfordshire. 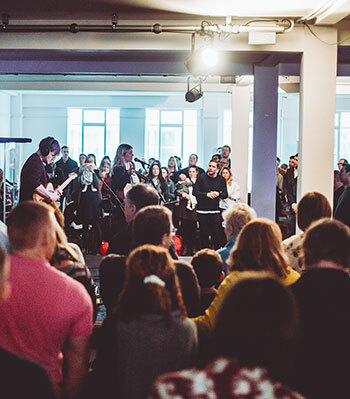 The Hub Church leadership report that around 30-35 people have come to faith since they started in 2011 and in the last few years seven people have been baptised. Around 50 people attend each Sunday and on the Sunday Church Army researchers visited, two-thirds of the attenders were under the age of 35. The Hub Church uses social media as “ building blocks” in young adults’ experience of Christianity.